Lime green or chartreuse is now a very popular garden color. We’ve all added Marguerite sweet potato vines or lime green coleus plants to our containers and gardens. 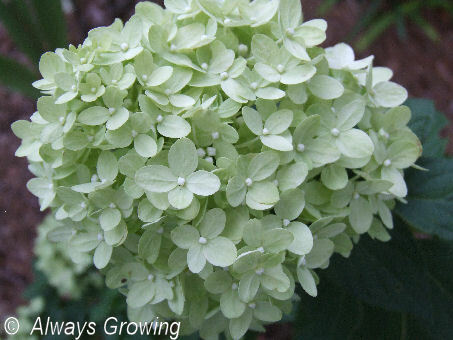 Growers have come out with lime green versions of many of our favorite plants – jewels of opar, geraniums, pineapple sage, and heuchera come to mind, but one lime green plant that has really made a splash recently is Limelight hydrangea. When this first came out a few years ago, I wanted this plant something awful, but never had the right place for it. Now, Little Lime, a smaller version of Limelight, has hit the nurseries, and as soon as I saw this plant, I grabbed it. When I purchased this, it was not in bloom, but now there are gorgeous lime-colored flowers all over this bush. Little Lime is one third the size of Limelight which makes it a better fit for my garden. As an established garden, there isn’t that much space available for big shrubs. Little Lime is supposed to grow about 36 to 60 inches tall whereas Limelight grows 72 to 96 inches tall. The big selling point of this shrub is the flowers. They have opened to the promised soft green and are lovely. I love this color. It is perfect for summer, and in autumn the flowers will turn pink and then burgundy. That should be nice to see also. 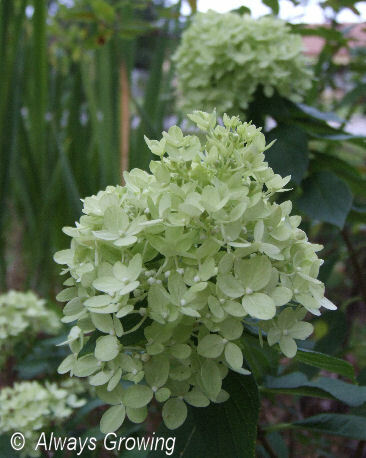 Hardy in zones 3 to 9 and not as water dependent as Hydrangea macrophylla all make this a very nice garden addition. 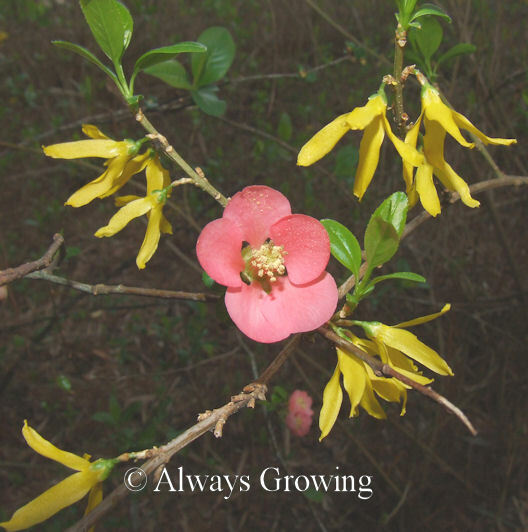 Even with our drought conditions this little shrub is doing well. I can’t wait to see it in a few years when it reaches its mature size. It may be Little Lime, but it sure is a big plus in my book. This past week was just perfect for gardening. Since I had the week off of work, there was finally time to do some planting, transplanting, and weeding. The weather cooperated – warm and sunny. That warm and sunny weather also helped spread the sweet aroma of certain blooming flowers. 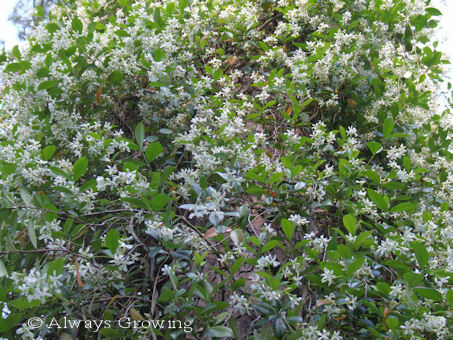 The first few days that I was out in the garden, the star jasmine (or confederate jasmine as we call it here) perfumed the air. When you start to get hot and tired, having such a pleasant fragrance around certainly does revitalize you especially when you can sit in the shade with a tall glass of iced tea. While I love this vine during springtime flowering, it has become invasive and is going to be pulled down this summer. It is growing all over the north side of the house and up a large pine tree. I have pulled it down once before thinking that it would slowly grow back. No such luck; it came back faster, stronger and bigger than before. Since it is now moving into the front and back garden, it will have to go. I certainly will miss its fragrance during the first warm days of spring. 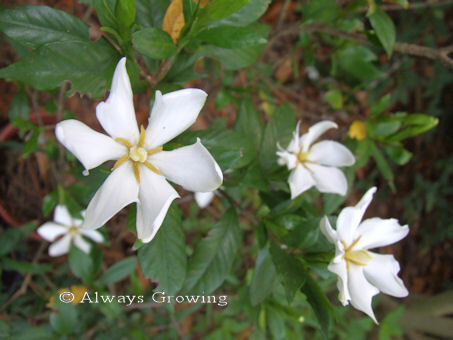 Just about the time that this jasmine’s flowers started to fade, the gardenias kicked in with their lovely fragrance. 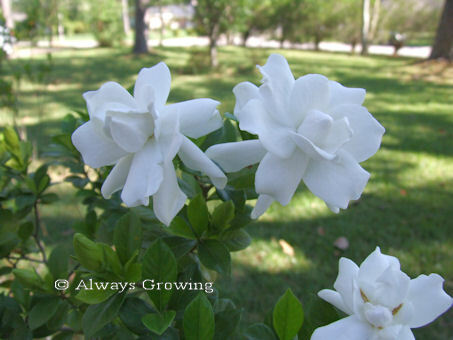 I now have gardenia bushes in all areas of our property, so no matter where you are, front or back garden, the sweet aroma of the gardenias is there. 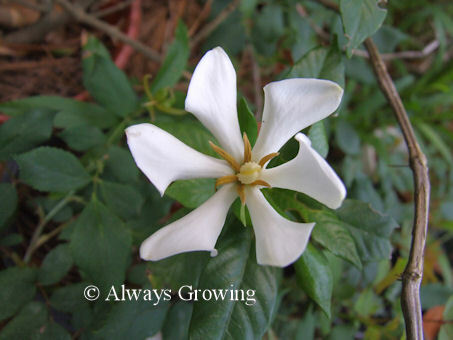 In the front gardens, there are the old-fashioned gardenias that have been there since before we moved in. 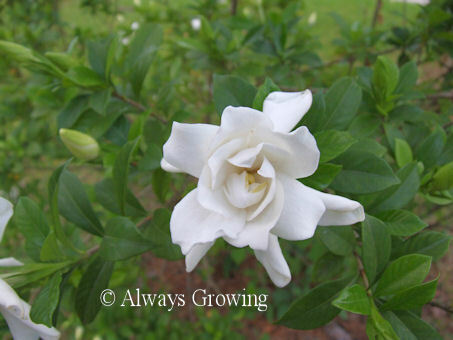 In the back garden, there is the single or daisy gardenia. This one is special because it was rooted for me by my mother from a tiny sprig. Now, it is a small but nice size bush, and I know it won’t be long before it is as big as the older ones. While there were a few exhausting days spent gardening, the “aromatherapy” of the jasmine and gardenias certainly did help to keep me going. Gardens should appeal to all our senses (not just the visual), and having strongly scented plants perfuming the air is sometimes forgotten. 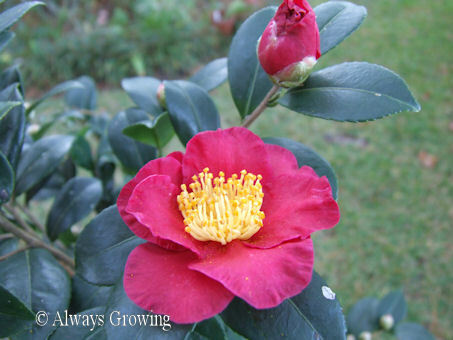 January 1st starts off a new year, but for gardeners, it is the coming of spring that starts a new gardening year. While there are signs showing up more and more each day that spring will return this year (I had my doubts a few cold weeks ago), there have been few flowers to show. That should change as the weeks go by, and we have more consistently warmer weather. 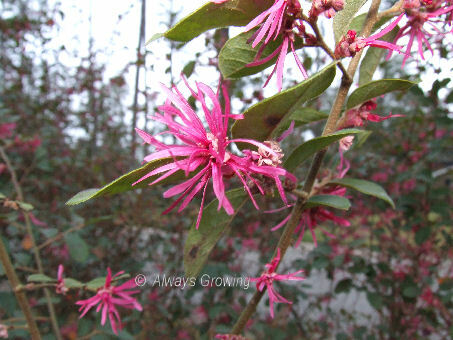 One shrub that has started to show off its lovely fushia-colored flowers is the loropetalum. 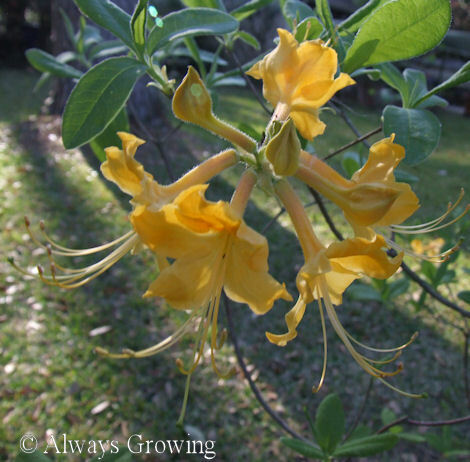 These shrubs usually start to bloom just before the azaleas, but that won’t happen this year. I checked the azaleas, and their buds are shut tight. They won’t be opening for a while. 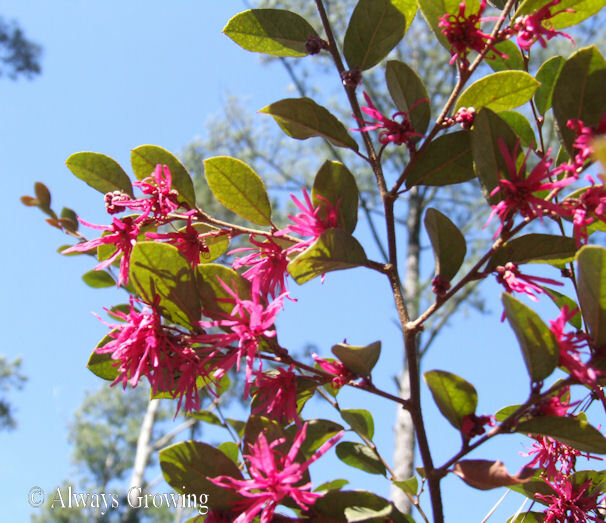 The loropetalum’s blooming is a sure sign that it won’t be long before all the spring bloomers will be showing up, starting a new gardening year. After several weeks of cold weather, we have warmed up to 80 degrees today. It feels like September, not late November. But, this is not unusual for the Deep South. It is common to have the temperature go up and down during the fall and winter. This sometimes makes for a confused garden. 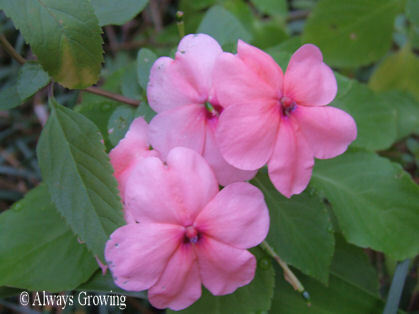 The impatiens, a tender perennial here, is still blooming. 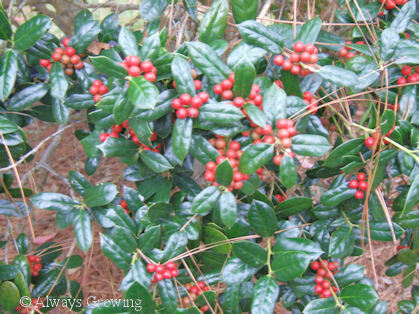 Nearby the impatiens is a dwarf Bufford holly bush with berries that are just about completely red. Sometimes, it can be a little disconcerting to see tropicals or tender plants blooming next to the more hardy winter plants. But, that is what I like about living and gardening in the South. It’s too early for Christmas; thanksgiving hasn’t arrived yet. 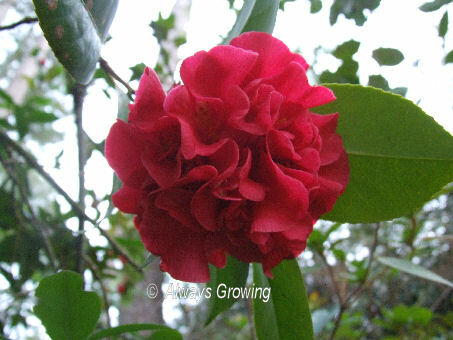 Tell that to Yuletide, a sasanqua camellia that just started blooming in my garden. This is still a fairly small bush since it has not been in the garden very long, and it is one of my favorite sasanquas. I first saw it in an article in Southern Living magazine, and I just had to have one. The first one I bought was not blooming but had three Yuletide markings or labels, but it still turned out to be another variety which was very disappointing. The next year, I found a Yuletide in bloom (which is the only way I would have bought it) and was so happy to finally have a correct one. Even though it has started blooming in mid-November, if it flowers as it did last year, there will still be flowers come Christmas. I have this bush planted in a fairly large container so I am able to place it by the front door to add to the holiday decorations. I guess after next week it will be time to think of Christmas. Yuletide just seems to be a little ahead of me. There are signs that summer is slowly coming to an end. We are not having daytime temperatures in the high 90’s, the sun is setting a few minutes earlier, and the lowering angle of the sun is already noticeable. I’ve also noticed that other bloggers are starting to post pictures of beauty berries. 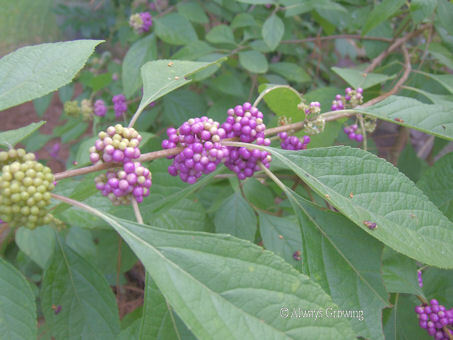 Beauty berry bushes (Callicarpa americana) display gorgeous magenta berries in late summer. The berries on my bushes have almost completed the color change. Besides the color, I like the way the berries tightly pack around the stems. This is just one more sign that fall isn’t too far away.